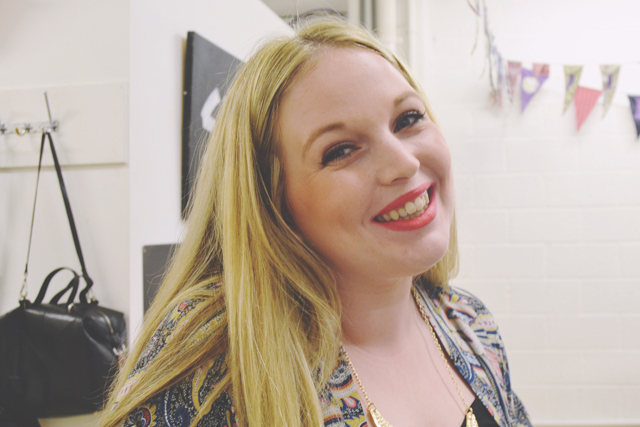 You all know I am a huge Lush fan, so I was really excited to be invited to the Summer Skin event at Lush Portsmouth. 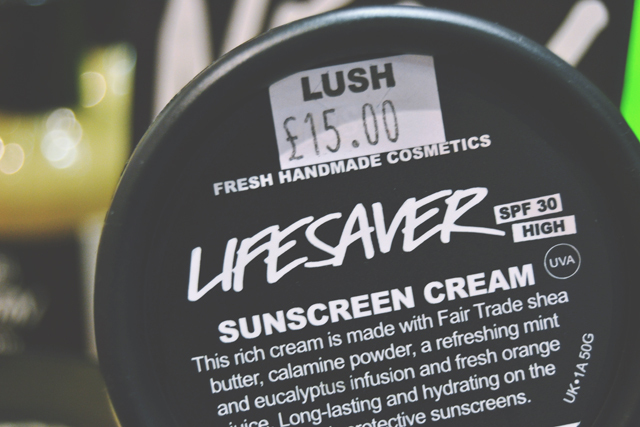 The aim of the evening was to tell us all about the new Lush suncare range, as well as giving us a real pampering with tutorials, demonstrations and a personal consultation. I knew it was going to be great, but nothing prepared me for how fantastic the evening was. 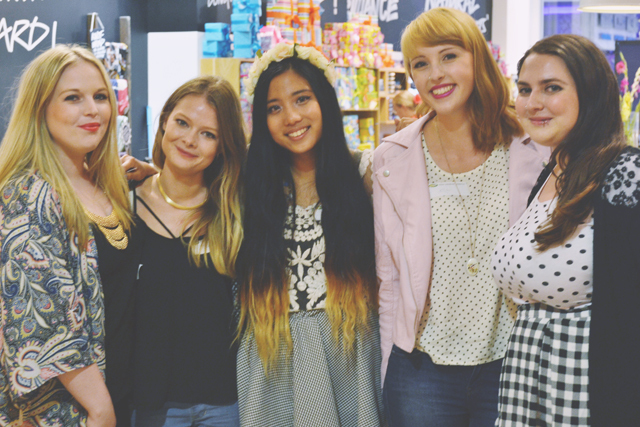 On arrival at the store, I met the other 4 bloggers at the event- Alice, Amy, Man Yee and Ella. Having such a small selection of bloggers was wonderful, as it was really intimate and the staff, who outnumbered us, were able to fully pamper us. We had the store all to ourselves, which was a dream. I felt like Michael Jackson in the documentary where he had every shop closed especially for him. This must be how the rich and famous live! 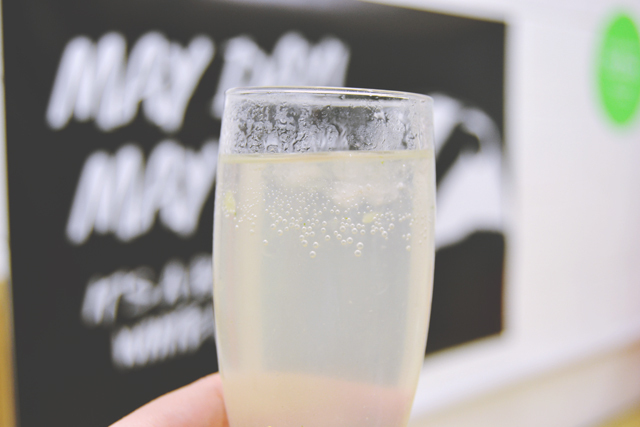 Virgin mojitos and smoothies were on hand for us to sip while we browsed the goodies in store. After a little time spent looking at the massage bars, we were shown into the classroom at the back (apparently they hold children's parties there- how amazing is that?!) and given a foot pampering tutorial. Our lovely hostesses taught us how to use the Stepping Stone foot scrub, then we applied the Volcano foot mask and very stylishly wrapped our feet in cling film! Once the mask had had time to really sink in, we finished with a slathering of Fair Trade Foot Lotion and dusted off with T for Toes foot powder. Once our feet had been thoroughly pampered, we headed back onto the shop floor and were each assigned a member of staff to give us a personal consultation. Emma was partnered with me, and she was amazingly helpful. We started with the suncare range, which I'm really excited about. As a pale girl who hates to be tanned, it's very important for me to keep my skin as protected as possible. 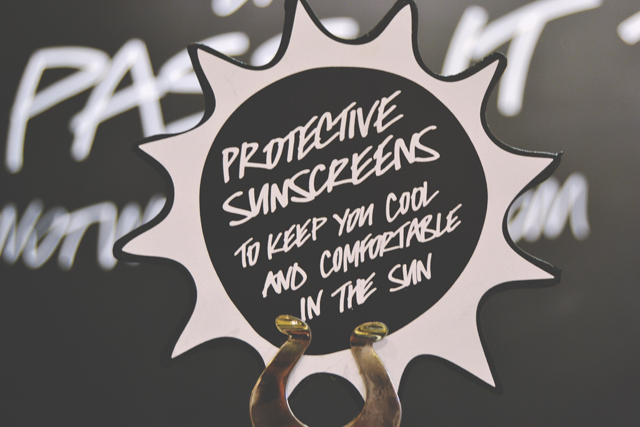 The Lifesaver sunscreen cream is so named because one of the men who tested it, a cyclist who rode across the country, used this phrase to describe how it had protected his skin. With a high SPF of factor 30 (all approved and verified), it's ideal for keeping your skin burn free. 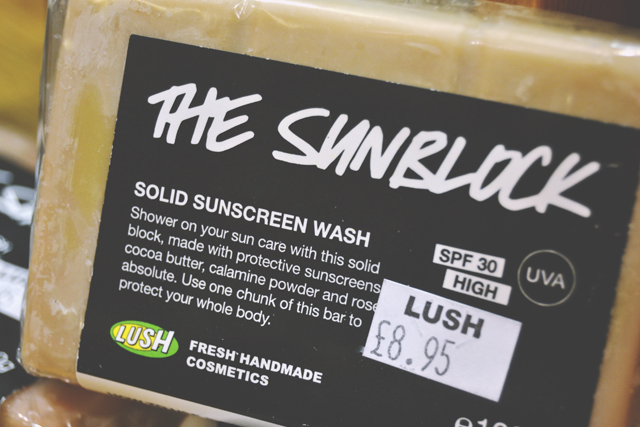 Lush also have a really exciting, innovative product- The Sunblock, which is a solid sunscreen. 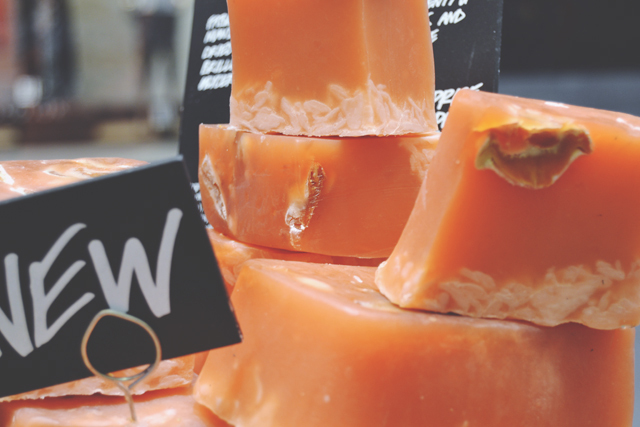 When you're in the shower, you simply rub it all over your body and rinse off. It's very handily divided into chunks, and each chunk is enough to protect your whole body. We then moved on to the Emotional Brilliance range. This was intriguing as I've never tried any of Lush's make up, but the colours were so intense and highly pigmented. 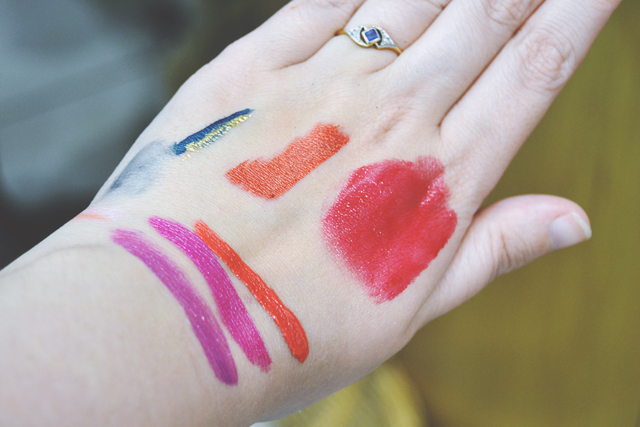 I'm more of a lip person, but the navy and gold eyeliner shades are very interesting! Once my consultation was finished, we all headed back into the classroom to make our very own Catastrophe Cosmetic face mask! I've just started using Lush face masks, and Catastrophe Cosmetic is excellent, so I was insanely excited about this. 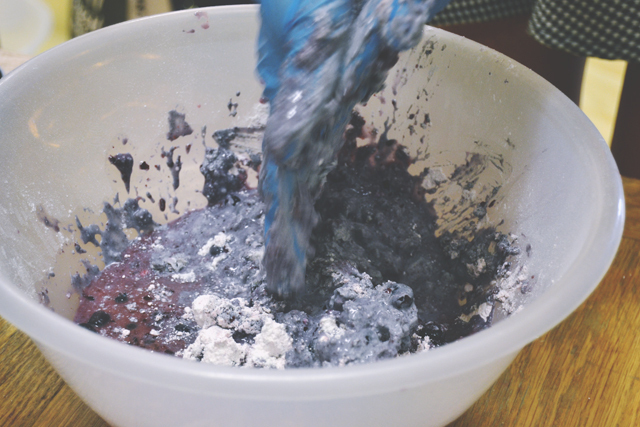 First, our hostess mixed the liquid and powder components in a bowl, then added the blueberries. This was the fun part- We each took it in turns to smush up the blueberries (technical term there), and create the clay-like consistency of the mask. I got carried away and made a bit of a mess! 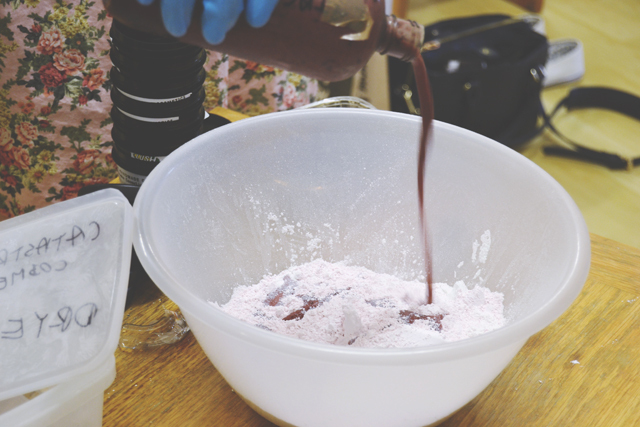 Once we'd all had a go, the mixture was divided up into five pots so we could each take our mask home. Hooray! We were then given some more time to hang out in the store, with some more demonstrations of the products, before heading home. 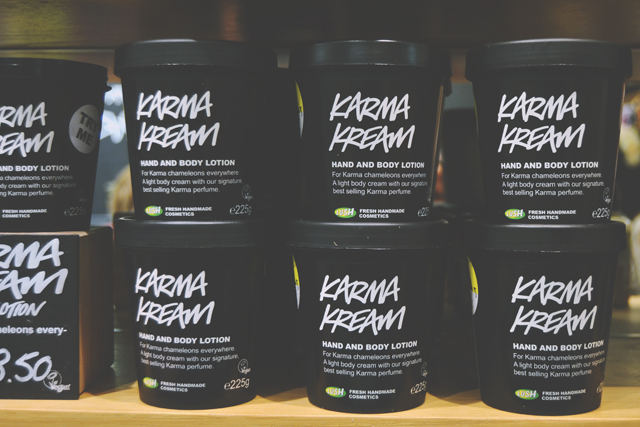 During our consultations, we were given the choice of a suncare product, an Emotional Brilliance product and a shower scrub to take home, and we were also given ample samples to try out at home, so we all left with bulging bags! Thank you so much, Lush! I had a fantastic time! Could not be more jealous! 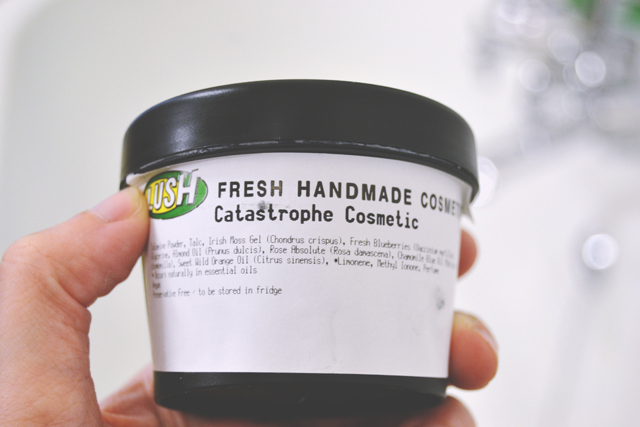 I've dabbled with the facemasks before but not catastrophe cosmetic - Would you consider giving some of the bits you picked up a review? Yep, I'm going to review all of them, although it may take a while! The sunblock in the shower is an intriguing product! I love all the make-up swatches and the navy eyeliner with gold over it (don't know if that what your intention or not) looks amazing. Looks like a great evening! It's such a good idea! With the eyeliner, my consultant was telling me about her friend who layers the two shades like that. It looks great! Like a peacock. Hi Becky I love your blog. 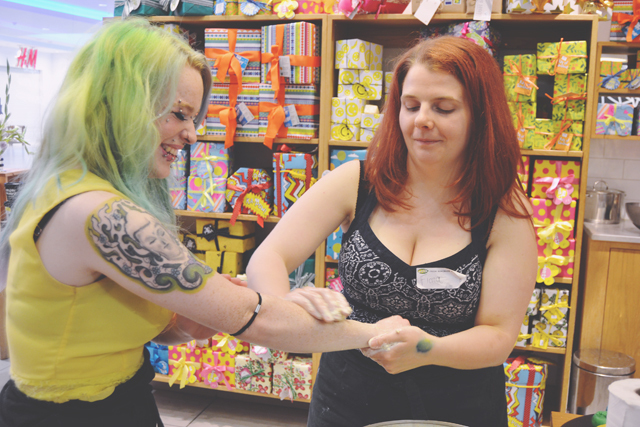 I also went to the Lush event, it was so much fun. I did my first YouTube video on my experience at the event. Thank you. I'm glad you had a good time. 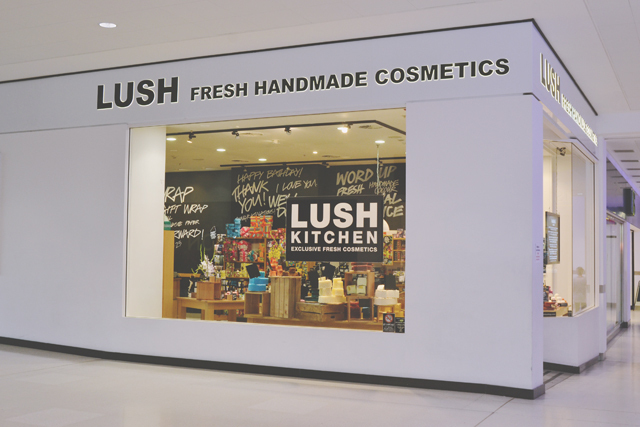 I've never tried Lush Make-up either! I was invited to the Plymouth event but i can't make it, devastated! Oh no! I'm sure they'll hold another one soon! 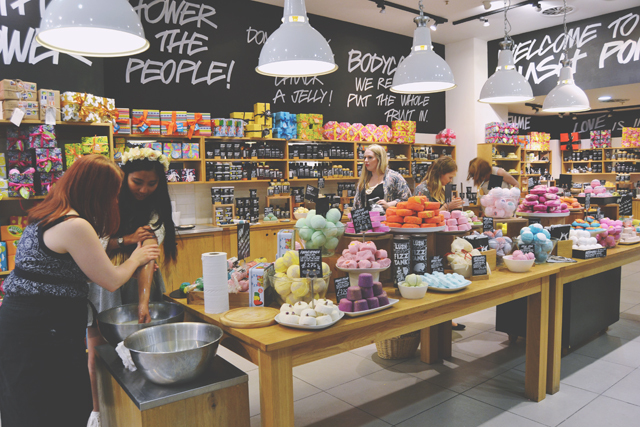 This looks so fun, I would love to attend a Lush event! Great post. They host a lot of them so hopefully you'll get to go to one. 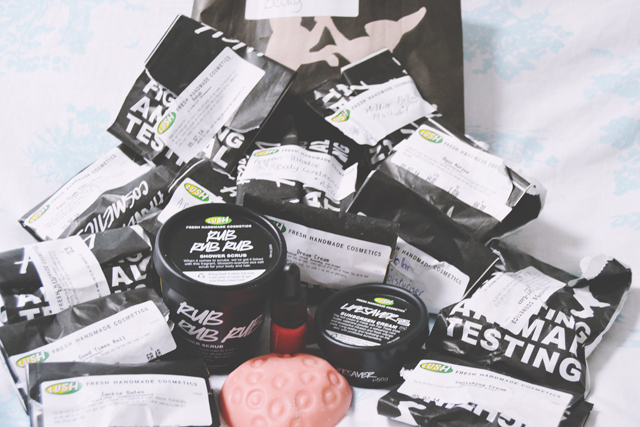 Is it a bad thing that I have never bought anything from Lush before? I feel like I missing some vital life experience with Lush. Yes, it's a sin! You NEED to buy something! 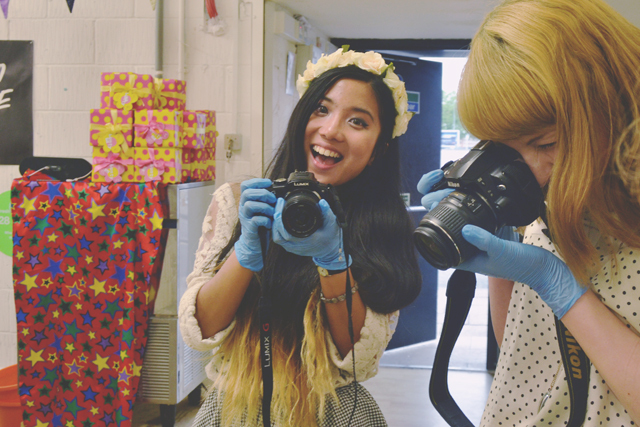 I'm so jealous you got to have this experience, the face mask looked insanely fun to make! Sounds like an amazing experience! I've been to a small lush party that one of my friends won, and it was lovely being pampered and getting a face mask done! 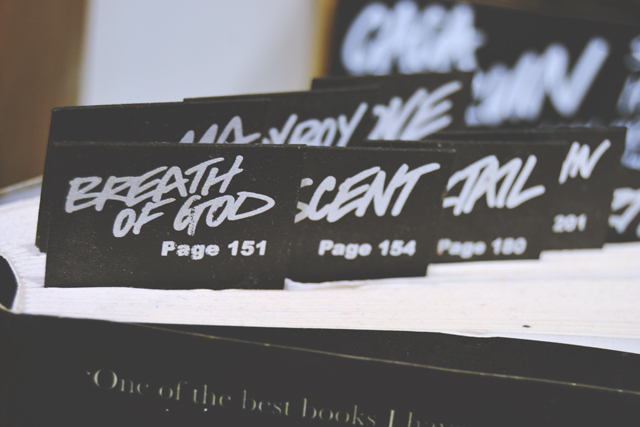 I do love lush. 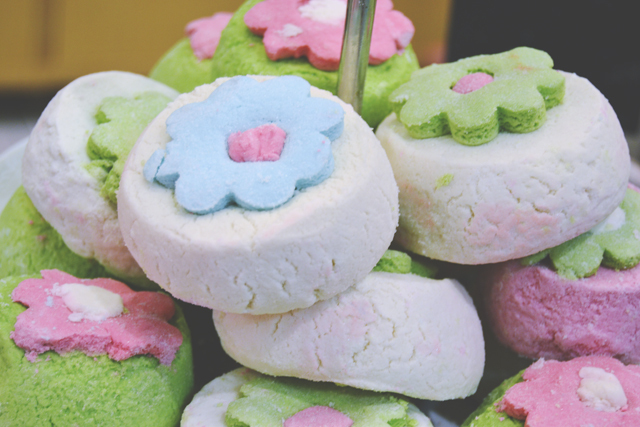 Lush events are the best, I could easily spend a fortune in this shop! Love the exterior of this one aswell, clean and white! I went to my first ever event last night witch was at lush Southampton :) it was amazing! we made face masks too, so fun!